Mix the mayonnaise, mustards, honey and dill together until well combined. Indoors, heat the oil in a deep fat fryer to 180ºC and add the shallot rings. Fry until golden brown then, using a slotted spoon remove the rings and place on a tray lined with kitchen paper. Sprinkle with salt and keep warm. In the meantime, barbecue the sausages until cooked through. 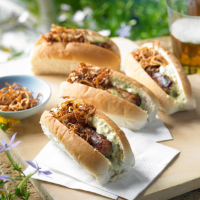 Slice open the hot dog buns and place a cooked sausage inside, spread some of the sauce on top and sprinkle with crispy shallots. This recipe was first published in Thu Aug 25 13:45:00 BST 2011.